Doubling the share of renewable energy in the global energy mix by 2030 can save up to USD 4.2 trillion annually by 2030 – 15 times more than the costs – according to a new report by the International Renewable Energy Agency (IRENA). 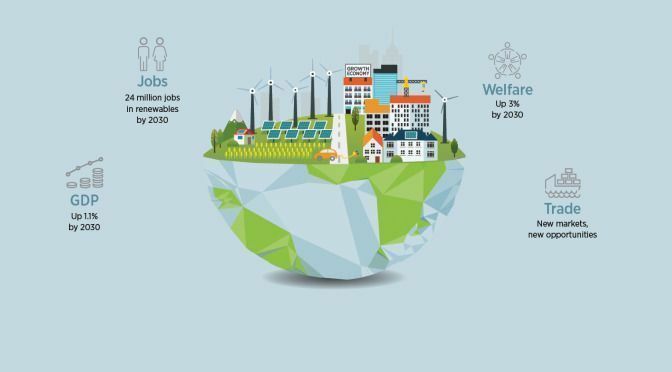 REmap: Roadmap for a Renewable Energy Future, released today at the Berlin Energy Transition Dialogue, recommends options to boost the share of renewable energy in the global energy mix from just over 18 per cent today, to as much as 36 per cent by 2030. This second edition of IRENA’s global roadmap broadens its analysis to cover 40 countries, representing 80 per cent of global energy use. According to the report, great strides have been made to increase renewables in the power sector, which is on track to generate roughly 30 per cent of the world’s electricity by 2030 (up from 23 per cent today). If a doubling is achieved, this share would grow to more than 50 per cent. 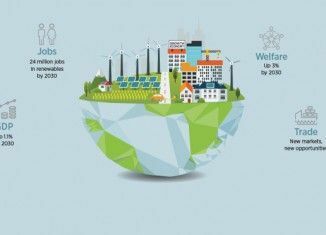 There is also great potential to increase renewables in transport, buildings and industry, but these sectors are currently lagging behind. Under existing national plans, the global renewables share would only reach 21 per cent by 2030. To achieve a doubling, the annual rate of renewable energy deployment would need to increase six-fold and would require an average annual investment of USD 770 billion up to 2030. Achieving this would increase the cost of the global energy system by roughly USD 290 billion per year in 2030, but the savings achieved through this doubling – thanks to avoided expenditures on air pollution and climate change – are up to 15 times higher than this cost. It would boost the global GDP by up to USD 1.3 trillion. To achieve this goal, the report identifies five priorities for action including: (1) correcting market distortions to create a level playing field; (2) introducing greater flexibility into energy systems to accommodate the variable nature of some forms of renewable energy; (3) developing and deploying renewable energy solutions for heating and cooling in new urban development projects and industry; (4) promoting electric transport based on renewable power and biofuels to reduce air pollution; and (5) ensuring the sustainable, affordable and reliable supply of bioenergy feedstocks.